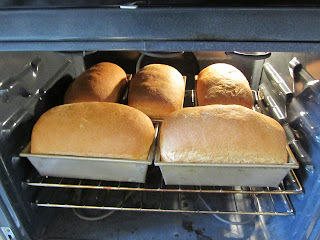 Every two weeks I bake 5 loaves of whole wheat sandwich bread for our family. I freeze half of the bread for the second week, and wrap and store in the pantry the other half for this week's sandwiches and toast. A friend was asking for a recipe, so I thought I'd go ahead and post it here, for any of you who might want to dip your toes into yeast bread baking. The dough is mixed in two stages, the first, the sponge (a wet dough), the second, the final mixing in of flour. For the best results, I rise (proof) my dough in my unheated oven, with just the light on. It keeps the dough at a consistently warm temperature, around 80-85 degrees F (26 - 29 C). Pour water into large mixing bowl. Sprinkle the yeast over the top of the water. Allow to soften for 5 minutes. Add sugar, salt and white flour. Mix well. Add whole wheat flour and beat until mostly smooth. Place bowl of dough into an unheated oven with the light turned on and the door closed. Allow to rise (or proof) until all bubbly, about 45 minutes to 1 hour. In a large measuring cup add water, soft butter and brown sugar. Stir to combine. Pour another 1/3 of liquid mixture over dough, and mix in 1 more cup of flour. Pour last 1/3 of liquid mixture and mix in with 1 cup of flour. Continue mixing in flour 1 cup at a time. Towards the end of mixing in the flour, it will be easier to add just 1/2 cup at a time. You should have a firm dough that is not sticky. After dough is well-mixed, knead in the bowl for 1 minute. Turn out onto floured counter and knead for 5 minutes, adding flour 1 Tablespoon at a time, to prevent sticking. Place dough in bowl, and put back in unheated oven, with light on and door closed. Allow to rise until doubled in bulk, about 45 minutes to 1 hour. Punch down and dump out onto the counter, scraping out the contents of the bowl. Knead for 1 minute, adding flour as needed. Allow to rest 10 minutes, while you butter your baking pans. For best removal of baked bread, butter your pans well. Divide dough into 5 equal portions (if you have a kitchen scale, use it for uniform baking). On a lightly floured surface, press each portion of dough into a rectangle, about 6 X 8 inches. Roll the dough up and pinch the seam, and turn under the ends. Flip the formed loaf over and place in prepared pan. 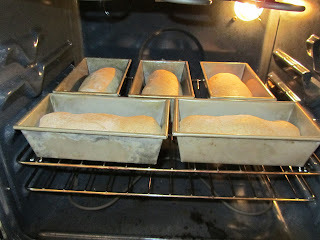 Rise in an unheated oven, with light on and door closed for 30 minutes, or until not quite doubled. 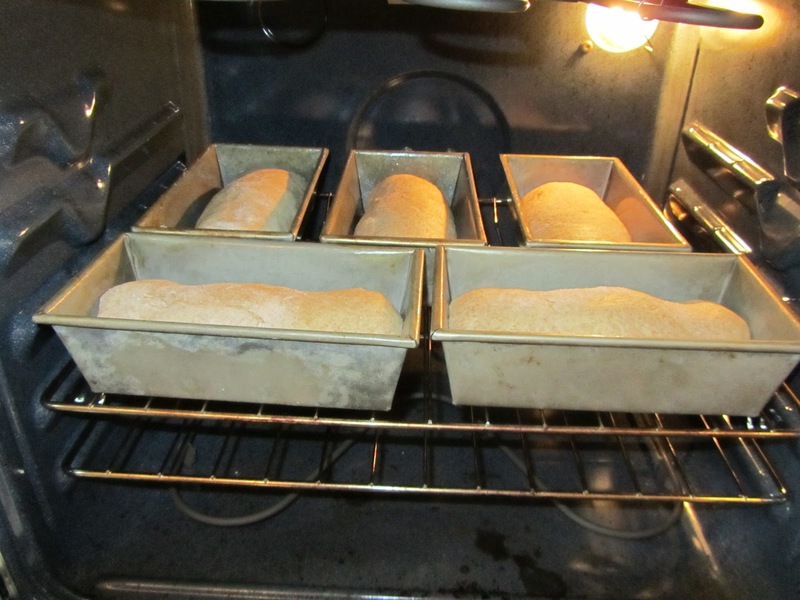 Remove from oven (you dough will continue to rise while oven preheats) and preheat your oven to 355 degrees F (180 C). Bake for 35 to 40 minutes, or until golden on top, and sounds hollow when tapped. When baked, your bread should come out of the pan if you give the pan a few hard shakes. If it won't come out right away, rest the pan on it's side for 10 minutes. As the bread cools, it'll contract a bit away from the sides. If it still won't come out (pan wasn't adequately greased), use a table knife to loosen the ends. Allow bread to cool before wrapping in plastic. I double bag my bread for the freezer and single bag for bread that we'll eat this week.